Amsterdam's famous Keukenhof Gardens are only open for a couple months each year, which can lead to long lines. But you can gain quick entry with a skip-the-line ticket and spend your time among the flowers rather than in a long queue—here's how. 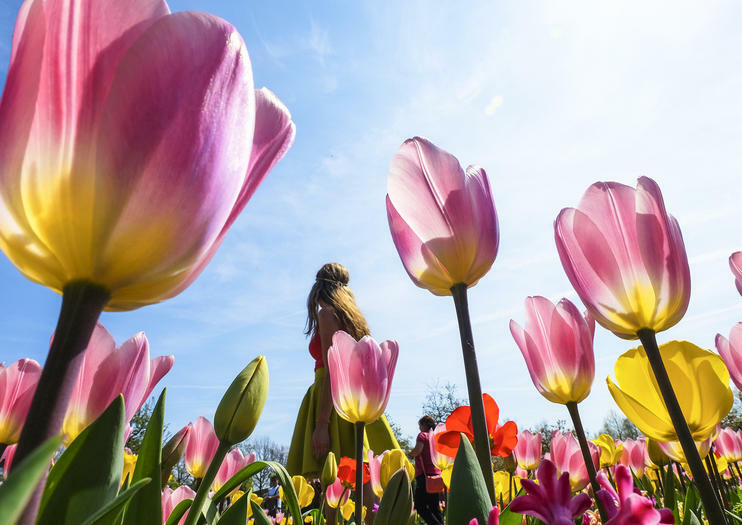 Maximize your time with a guided skip-the-line Keukenhof tour that also includes other top sightseeing activities, such as an Amsterdam canal cruise, a visit to the Van Gogh Museum, or a trip to see Holland windmills. Most tours include roundtrip transportation from Amsterdam, about 40 minutes away. Book ahead to ensure that you catch the buds in bloom. If you prefer the flexibility of independent travel, consider investing in a Holland Pass for either Amsterdam, The Hague, or Rotterdam and enjoy fast-track entry to Keukenhof Gardens and a host of other city attractions.